If you haven’t seen Netflix’s newest psychological thriller, Velvet Buzzsaw (2019), this may not be a good time to read this article. Otherwise, if you choose to proceed and disregard this warning (against spoilers, obviously), fret not I, I will try my hardest to still make the experience of watching this as good as the first time. Let’s just get it out of the way first, just so we’re clear: That naked Jake Gyllenhaal photo you’ve been seeing online is from there. The next thing that’s absolutely vital to this movie is Ventril Dease, the fictional painter whose eerie paintings brought bad luck, and eventually death, into the lives of the characters. Now, I don’t know about you, but the first thing that came to mind the minute Josephina (stereotypical horror movie character who disregards suspense music and goes about making a bad decision that ultimately ends up affecting everyone) spotted the paintings Dease left behind were the works of Norwegian painter Edvard Munch. Munch was, of course, known for the iconic painting The Scream, an expressionist painting famous for its shrieking figure and lurid lines. Dease shares the same knack for the grim, depicting anguish and dark emotions through portraiture (and well, literal blood). Don’t believe me? Apart from Velvet Buzzsaw, you might want to check out these films about Munch, which luckily screens for free this February at the Museum of Contemporary Art and Design at the De La Salle-College of Saint Benilde Manila. The arsenal of Norwegian painter goes far more than his 1893 masterpiece. In fact, The Scream was a deviation from his usual works which “more often exuded melancholy and resignation,” as the 2013 documentary Let the Scream Be Heard by Indian director Dheeraj Akolkar illustrates. In less than an hour, the film tackles Munch’s extensive body of work which spans over 60 years and 18,000 pieces. More than imagery, Dease and Munch seem to share a past punctuated with death. 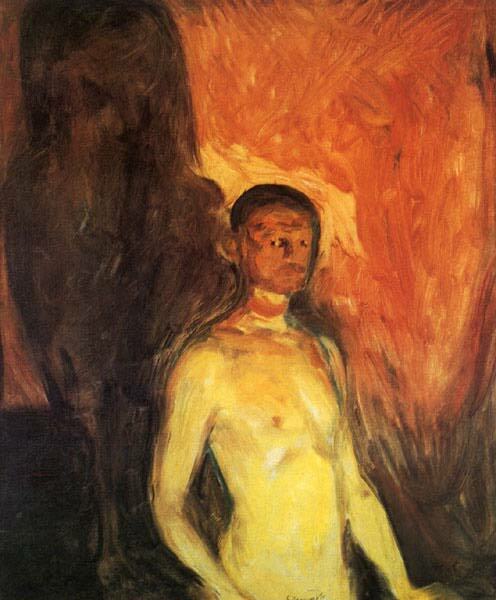 Munch’s mother and sister died of tuberculosis when he was just a young boy. He’s also done a few self-portraits but one, in particular, highlights his fascination with mortality. Self-Portrait in Hell, which he finished in 1903, shows a naked figure aflame. All these and more you will find out through the lenses of five filmmakers behind biographical documentaries Life, 1863-1944, Faces, A Self Portrait, and Post Mortem. You can also catch Tim Burton’s Big Eyes (2014) for free on Feb. 22 to 23 if you missed it the first time it screened in theaters. The movie centers on the works of American artist Margaret Keane whose husband took credit for her paintings of doe-eyed figures in one of the biggest frauds in art history. Museum of Contemporary Art and Design is located at the ground floor of the Benilde School of Design and Arts in Dominga St., Malate, Manila. Both Edvard Munch free film screenings are courtesy of the Norwegian Embassy and the Norwegian Film Institute.